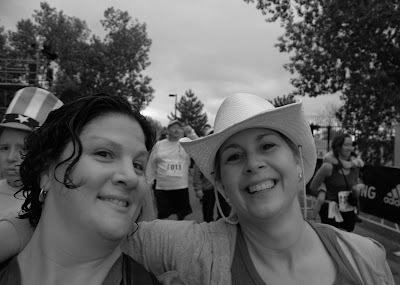 I had the honor of crossing off another item from my ‘life list’ yesterday-completing the ‘Bolder Boulder’ 10k race with my buddy Diana (Pink Cowboy hat girl–as she became know as during the race)! There are so many reasons I love Boulder; the amazing flowers that line the Pearl Stree Mall, the view of the flatirons, the food, the infamous Boulder Bookstore, the noticable good vibes…and the people-watching. But the race took the people-watching to a new level. Very unique “characters” (including Captian America not pictured) were everywhere enjoying the day–despite the chilly temps (note the pic of the tye-dye bikini girls and the pink dress dude) and the light rain. All I saw that morning were people enjoying themselves, fun bands along the roadside, folks cheering us along and lots of smiles! 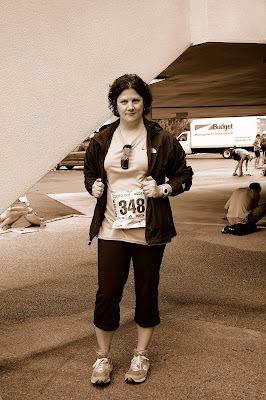 It was such a rush to be part of the 2008 Bolder Boulder and even more exciting was walking through Folsom Field (University of Colorado stadium) at the finish line to the crowd cheering us on. And the Memorial Day ceremony was quite touching–evoking feelings of patriotism and gratitude for the real heroes of our culture who gave their lives to our great country. I love the spirit of the people there. And I really value the people who love life in general–many of whom can be found in Boulder, Colorado! I love Boulder too. 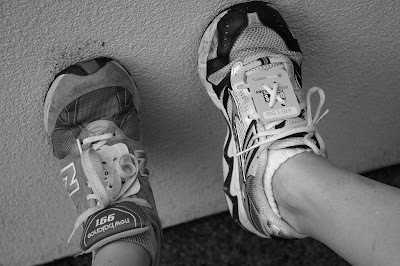 Next year I’m doing the 10k. Yay for you!!! I’m so jealous! 🙂 And even though I don’t know you IRL, I’m proud of you for following through on this. Way to go! © 2019 Mary Elizabeth Graff Photography|ProPhoto Photography Blogsite by NetRivet, Inc.